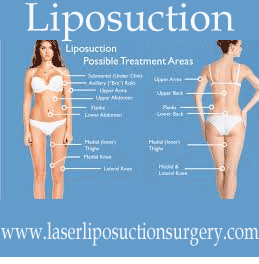 Liposuction is one of the most commonly sought after cosmetic surgeries in the United States. It is a type of plastic surgery which is less invasive in nature and helps you sculpt your body to the desired shape. When done by a certified plastic surgeon liposuction can be beneficial to many. Bruising and scarring – this procedure is not very invasive and the incisions made to insert the tube with which the procedure is performed are very small, however, there can be bruising and in rare cases scarring of these tissues. These are usually short term side effects and with proper care taken after the procedure will go away after a few days. Cellulite – cellulite is the bumpiness that we often see in our skin especially around the thighs and upper arms. Many people think that liposuction also removes cellulite, however, with this surgery, there are chances of cellulite to appear even more than before. This is because our skin has stretched along with fat to a certain degree and once the fat is removed the skin needs to readjust to the new shape which may not happen immediately and in some cases may not happen at all. Infections – Skin infections after surgery are rare but can happen. These happen mostly because of some negligence either on the part of the surgeon or even the patient postop. To avoid this after the surgery ensure that the affected area is treated as advised by the surgeon. Fluid leaking or accumulation – Liposuction involves removing fat from the body, which may be done by injecting fluid in the area. Due to this even after the surgery, some patients experience fluid leakage and a few may encounter fluid retention in the body. In case of retention, the fluid may need to be removed by draining with a needle. Internal puncture – the tube that is used to perform liposuction if penetrated deeper than required may puncture another internal organ. In this case, immediate surgery may be needed to mend the punctured organ. Fat embolism – in liposuction the tube called cannula is used to break away fat from under the skin. In rare occurrences, if any of this loosened piece of fat breaks away from the affected area and enters a blood vessel it can cause clots and also manage to reach some major organ like the brain and cause an emergency. Deep vein thrombosis – similar to fat embolism, post liposuction sometimes blood clots can form in deep veins in your body which can lead to this ailment. This also needs to be immediately treated by the doctor. Usually, DVT can be avoided by ensuring that you move after the surgery and take care of medication as prescribed by the doctor. Kidney and heart problems – a very rare condition, however sometimes due to changes in the fluid level in the body during this procedure major organs can get impacted. To make sure the patient is fine it is needed to monitor the vitals during and after surgery. These are the most common and rare medical risks that may be encountered with this surgery. Although you may be lucky not to face most of these it is advisable to discuss all your concerns with the physician beforehand. You must ensure that while taking the decision for getting this procedure you consult a certified physicians only. Your physician will do a detailed analysis of your needs and medical history and inform you of all the risks that may come along with the surgery. Although it is a fairly simple and low-risk procedure, there are certain things that you must be aware of beforehand so that you can ask your doctor the correct questions.